Lindsey Graham: Tea Party will "Die Out"
In the past year, many Republican lawmakers have sought the support of the conservative Tea Party movement. But Sen. Lindsey Graham of South Carolina, bucking his party once again, is predicting the movement will "die out." "The problem with the Tea Party, I think it's just unsustainable because they can never come up with a coherent vision for governing the country. It will die out," Graham said in an interview with the New York Times magazine. "We don't have a lot of Reagan-type leaders in our party. Remember Ronald Reagan Democrats? I want a Republican that can attract Democrats." Graham added, in a comment sure to rile some in the GOP: "Ronald Reagan would have a hard time getting elected as a Republican today." In the current hyper-partisan atmosphere in Washington, Graham is one of the few Republicans willing to work with Democrats on hot-button issues like comprehensive energy legislation and immigration reform. In April, he called the controversial Arizona immigration law -- which has galvanized both liberals and conservatives -- unconstitutional. He has signaled he could vote to confirm Elena Kagan to the Supreme Court and even chided his Republican colleagues for labeling liberal icon Thurgood Marshall a "judicial activist." Graham's willingness to cross partisan lines has won the ire of Tea Partiers and other hardline conservatives. Republicans in South Carolina have even officially censured Graham for his work with Democrats on issues like immigration. 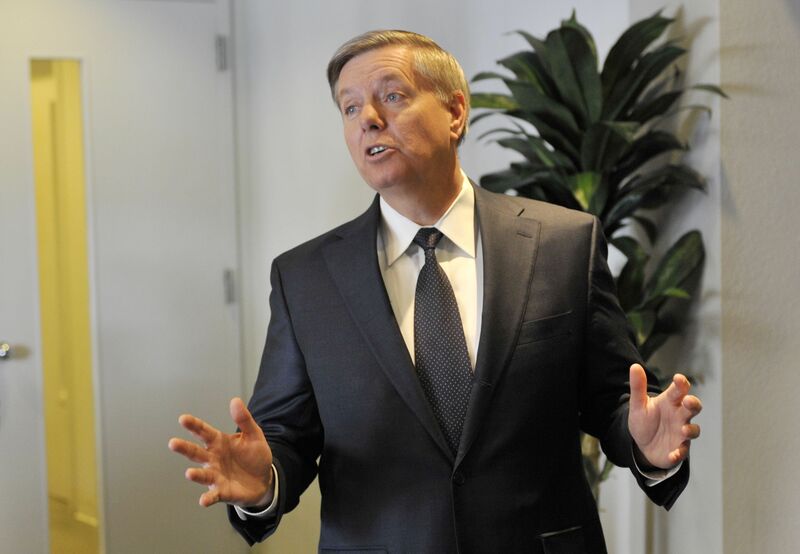 "Everything I'm doing now in terms of talking about climate, talking about immigration, talking about Gitmo is completely opposite of where the Tea Party movement's at," Graham told the New York Times. The senator described a contentious meeting he had in his office with a group of Tea Partiers. Graham said he asked them, "'What do you want to do? You take back your country -- and do what with it?'" "Everybody went from being kind of hostile to just dead silent," he said. In the story, Graham said that Republicans who will likely be elected in this year's midterm elections will be "more like me, not less like me" -- though he made an exception for at least one Tea Party-backed candidate, Nevada's Sharron Angle. "Now, this lady from Nevada?" Graham said. "Probably not." During a Tea Party rally this spring, a speaker said Graham was working with Democrats out of fear that they would out the lifelong bachelor as a homosexual. Graham smirked at the mention of this incident, the Times reports. "Like maybe I'm having a clandestine affair with Ricky Martin," he said. "I know it's really gonna upset a lot of gay men -- I'm sure hundreds of 'em are gonna be jumping off the Golden Gate Bridge -- but I ain't available. I ain't gay. Sorry."